Following several highly challenging years due to repeated terrorist attacks coupled with a weak economy, the French travel market began mounting a recovery in 2017. Since the election of reformist President Emmanuel Macron, the country has reduced its budget deficit to within European Union (EU) guidelines, while at the same time curtailing unemployment and restoring consumer confidence. Stronger security measures have also allayed concerns about terrorism, and the overall outlook for the travel sector is favorable. Leisure travel – including inbound, domestic and outbound – is on the rise. International visitors have returned, while French consumers have resumed their traditional pattern of taking a long summer vacation along with multiple shorter trips throughout the year. Business travel, particularly that associated with meetings, incentives, conferences and exhibitions (MICE) has also recovered, thanks in part to the renewed economic stability. In addition, the government has intensified its efforts to support the tourism sector, announcing ambitious plans to grow international arrivals to over 100 million by 2020. While continued growth remains dependent on the terrorism situation in the country, events such as the 2023 Rugby World Cup and the 2024 Summer Olympics in Paris should help cement growth in the medium term. Still, the outlook is not entirely positive. A series of rolling strikes by France's strong public and private sector unions as well as the recent "Yellow Vest" protests are adversely affecting the attractiveness of France as a destination. And given the importance of the U.K. as a major inbound market, continuing uncertainty over Brexit remains a worry. 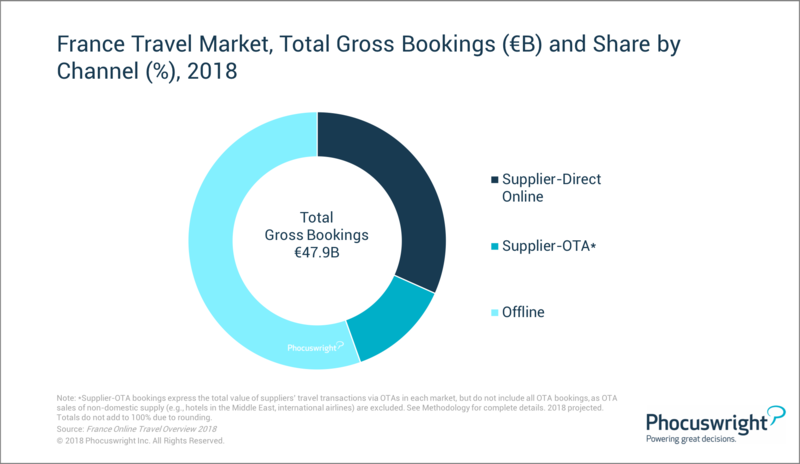 As a result, the French travel market is projected to grow modestly for the next several years, climbing from €47.9 billion in 2018 to €53.7 billion by 2022. Phocuswright's recent travel research report – France Online Travel Overview 2018 – provides a top-level overview of the French travel market, including background, key characteristics, market structure, and major players and trends in each segment. Purchase this publication here or subscribe to Phocuswright Open Access for your entire company.